It’s that time of year again! Time for my round-up of the vegan, vegetarian, and gluten-free options at the Disneyland Resort. In previous years, finding these options have been a little more difficult, and am used to going around from booth to booth to ask questions about where to find these items (particularly vegan items). 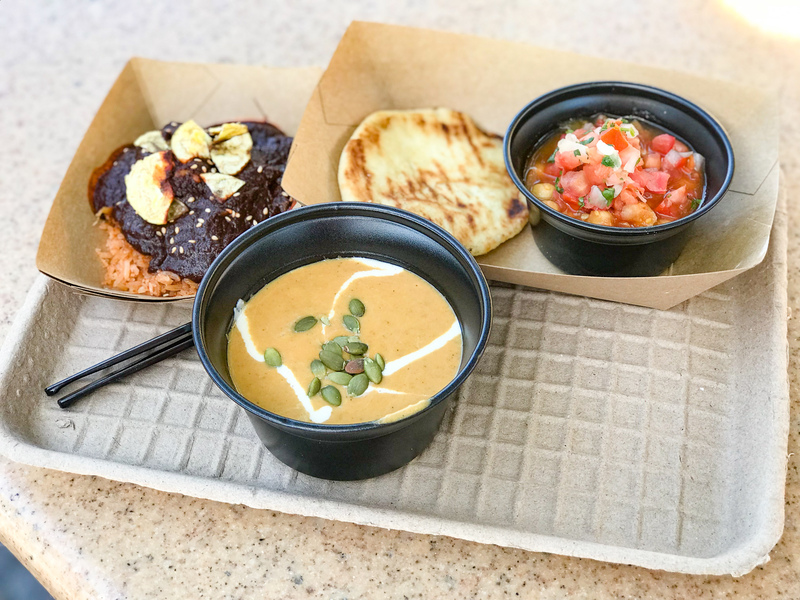 Well Disneyland Resort Festival of Holidays 2018 has knocked it out of the park this year, by having an incredibles amount of vegan, vegetarian, and gluten-free items, as well as easily listing them all in the Tasting Passport. I tasted this for myself, and this macaron is absolute perfection. The cookie is so soft and moist, with a very generous amount of filling. In the middle, is a solid piece of chocolate. Yum! This booth is across from The Little Mermaid ride. If you have a sweet tooth and an affinity for Thanksgiving foods, then you should stop by here! Spicy Celebrations is near the Silly Symphony Swings, and this year has one of my absolute favorite items, latkes! And there you have it, your complete guide to Disneyland Resort Festival of Holidays 2018 vegan, vegetarian, and gluten-free items! To learn more about all the vegetarian offerings at Disney California Adventure click here, or you can find the guide to vegetarian items at Disneyland here. For the guide to vegan, gluten-free, and vegetarian items at Lamplight Lounge, visit my post here.